Carsten Wartmann, the great writer of many blender books, is now officially writing the second edition of the Blender Gamekit books, the new books will cover the new functionality of the new Blender. The new book will cover all new features including glsl, multilayer textures, character animation, and logic improvements. There will be new as well as some old tutorials but all specially written for the new version of Blender. 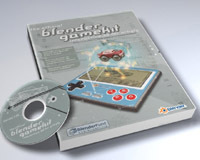 Also, thebook will be liscensed under the Creative Commons Attribute.Â Now this means the old Blender Gamekit is avalible free via download at the link below. Now go do some blending! Awesome! This is wonderful! Game instructions updated and free for the open community! Thanks so much Carsten Wartmann! You could include the link to the article on yofrankie.org, it has additional information. Its good news though, we've been in need of a Gamekit book update for a while. Now that is what I call a great news. I'm looking forward to it. Yes, great news. Blender is growing so fast that all new book is really welcome! Thank you ! I know it sounds a wee bit hasty but do you have any idea when it will be released? thx! In the official announcement, Ton says that it's slated for December, just in time for Christmas. Can't wait! I purchased the old GameKit a couple of months ago and haven't even had time to start but I'll purchase the new GameKit as well. You guys should also update the eShop since the GameKit is still listed there at a price of euro 8. Wow that's great news. I didn't even know about the old book so thanks for it too. I've been searching the internet for anything I could download about the game engine. I tested to make something, i read the 12th chapiter, it's very interesting and i can make funny stuff ! tanks a lot ! Brilliant. Thanks for the free download. I look forward to the second edition when it is released. i just thought of a funny game: Southpark's Eric Cartman's "Kick 'em in the nuts 2000". That'll be dope. bought it already 2 years ago. But why is it still in the e-Shop for â‚¬ 8.00? @RedBirdiii: They say that they will keep it as a donation support purchase. That is why they are still selling it. I was going to purchase this but have already downloaded it and will purchase the upcoming version but inbetween will see what can be adlibbed to the current version with the first gamekit. Chap. 17 and 18 has scaried me ! I didn't anderstand anything. I hope 19 is easier. @redbirdiii: Some people are on dialup they pay per minute. "We are currently processing the work for the book, we are scheduling to deliver books early december. For that reason this download will become available freely on the Apricot blog project. We keep it in our store as a donation/support product though. Thanks! " But why the first edition have sell on the internet? thanks a lot for you and the writer. I have found text sources and game files of Blender Gamekit 2 at http://download.blender.org/documentation/gamekit2/. I wanted to ask whether it is legal to download it from there? thank's again , and please pleaseeeeeeeeeeee send to my some lesson's about it .